It's so true what they say - everything old becomes new again. And the latest design trend to help prove this point is warm and sophisticated gold! I think it's because of the recent popularity of grays and greige's in home decor. The warm tones in gold balance beautifully with cooler spaces and paint colors. Well whatever the reason, here are a few gold finds that are simply chic, on the cheap! I've got my eye on that Nate Berkus Accent Table! It's perfect for a small spot next to a sofa or club chair to set a drink or book. 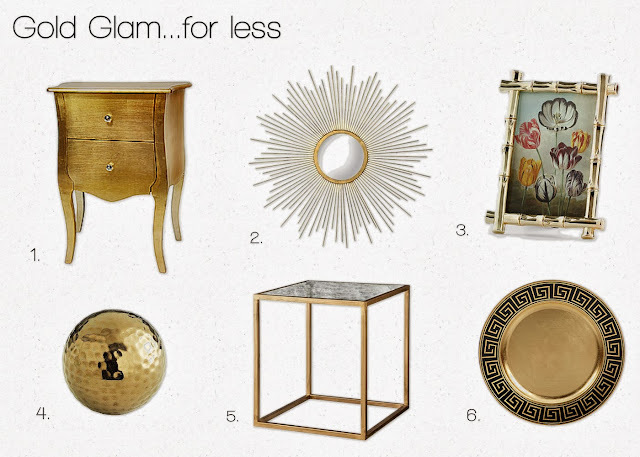 And several of those gold spheres or decor balls from Pier One will make a chic & affordable centerpiece. Finally those greek key chargers from Z Gallerie will update your Holiday dining table beautifully. So what do you guys think, are you loving the new gold trend like I am? And if so, what's your latest gold find? The Krylon Gold Metallic spray paint! yes, I've literally turned my finger gold spraying away from pots to baskets! LOL! Love your finds Jane! Oh I've got that spray paint too....love it!! Our minds are in the same place today! I just posted all of my favorite gold accessories too! Love that end table- Nate Berkus never goes wrong! Our minds are in the same place today, I just posted all of my favorite gold accessories too. I also included a super cheap and easy DIY project. I love that Nate Berkus end table! Great minds do thing alike, lol!! Love all your gold finds. And your spray painted skull is Fabulous! These are all truly glam and gorgeous finds, Jane! And I love that they are so affordable. I love the nate berkus side table, so chic for so cheap!